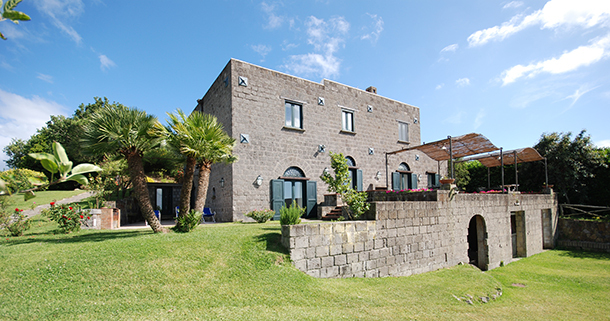 The villa lies in the Massa Lubrense hills inside a large estate with a beautiful view of the Gulf of Naples. It is surrounded by a large, well-tended garden that is full of flowers and Mediterranean plants, with several areas furnished with tables and chairs that allow you to enjoy the pleasures of dining outside while taking in the view. The house is on two floors and is furnished with good furniture with some antiques and is equipped with all modern comforts: dishwasher, washing-machine, TV, stereo/CD and telephone. The large living-room is warm and welcoming and has comfortable sofas and armchairs. Within the grounds, which you enter via an automatic gate, there is covered parking for four cars. Within the property guests have use of a private swimming pool (4mx8m). Less than a kilometre away is Termiri, where there is a general food shop. The village of S. Agata, about 4 kms away, has all other necessary services along with a coffee bar and well-known restaurants. During your stay there is an obligatory cleaning service for three hours a day, five days a week to be paid on the premises, and on request they can organise the preparation of lunch or dinner by qualified personnel. Sorrento is about 6 kms away, Positano 15, and the nearest beaches (pebbles) are at Nerano about 3 kms away. GROUND FLOOR: large living-room with fireplace, dining-room, kitchen, 1 double bedroom with bathroom with shower, WC with washbasin. FIRST FLOOR: 1 twin bedroom, 1 bathroom with shower, 1 twin bedroom, 1 double bedroom with bathroom with tub and access to the terrace. Large enclosed garden with view of the sea. Paid on site in cash: Obligatory cleaning during the week: 3 hours a day, 5 days per week for a total of 135 Euros per week.